GALION — There’s at least one more track and field competition in Michaela Slone’s immediate future. The recent Galion High School graduate has been selected to compete in the Midwest Meet of Champions, which is scheduled to begin at noon on Saturday at Ohio Wesleyan University in Delaware. The meet features top senior track and field athletes from Ohio, Michigan and Indiana. Slone said longtime track and field and cross country coach Dave Kirk nominated her for the chance to compete in the Meet of Champions and she was chosen by the coaching staff of Team Ohio. Kirk, a 2012 inductee into the Ohio Association of Track and Cross Country Coaches Hall of Fame, informed Slone about the honor at her graduation party last weekend. Slone will join other Team Ohio athletes on Friday at Ohio Wesleyan for practice, a team meeting and dinner with Team Michigan and Team Indiana members. Team Ohio wraps up the day with a viewing of the film “McFarland USA,” which tells the story of a small, predominantly Mexican-American high school in California that captured the state cross country championship in 1987. During an interview conducted Thursday evening, Slone said she was unsure about which events she would be competing in at the Midwest Meet of Champions, but believed she would be placed on at least one relay team, which she hopes will be the 4×100 relay. 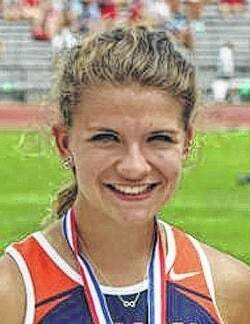 Slone represented Galion at two OHSAA state track and field meets and helped the Lady Tigers win the 4×100-meter relay state championship in 2014. Slone and Galion teammates Clair Erlsten, Alasha Williams and Sydney Hunt finished as state runners-up in the 4×100 relay finals in 2015. This fall, Slone will be attending Heidelberg University in Tiffin, Ohio, where she plans to major in health science and compete in track and field and cross country. After the Midwest Meet of Champions, Slone said she has no plans to compete in other meets for the remainder of the summer.